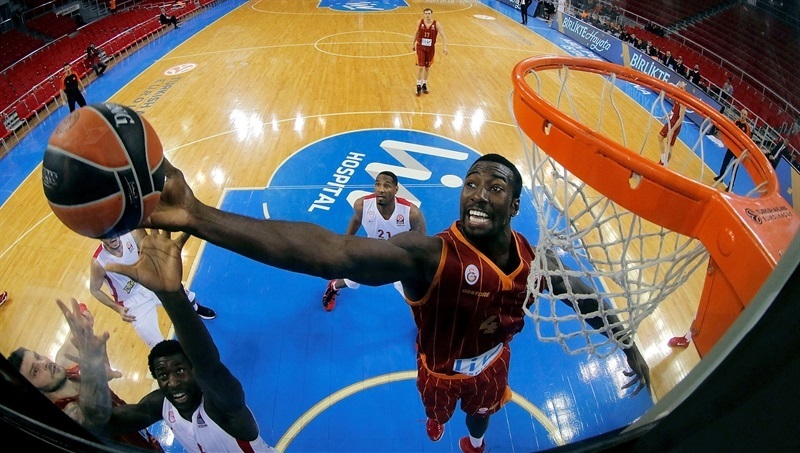 In an epic game that went down to the wire, Galatasaray Liv Hospital made it to the 2014-15 Turkish Airlines Euroleague Top 16 by downing Olympiacos Piraeus 79-74 at home in Group D on Thursday. Galatasaray needed to win and for Valencia Basket to beat Neptunas Klaipeda, which is exactly what happened. Both teams finished the regular season with 4-6 records, but Galatasaray was fourth due to its tie-break advantage against Neptunas. Olympiacos had clinched first place last week and finished Group D with an 8-2 record. 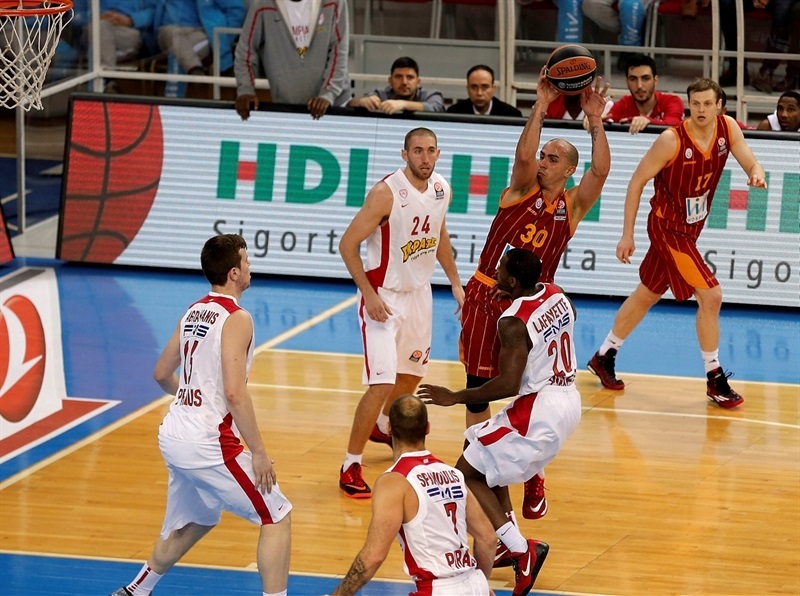 Carlos Arroyo paced the winners with 24 points. 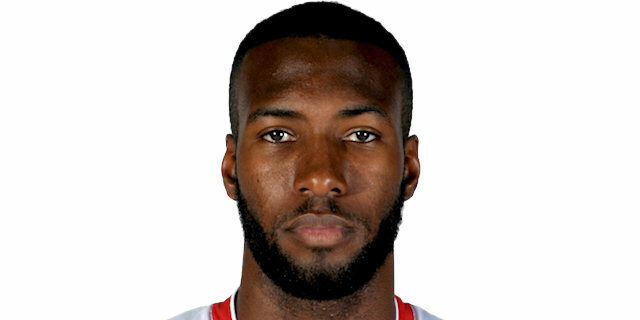 Patric Young added 13 and 13 rebounds, Vladimir Micov also had 13 points, Martynas Pocius scored 11, while Sinan Guler contributed 10 for Galatasaray, which only used seven players in the win. 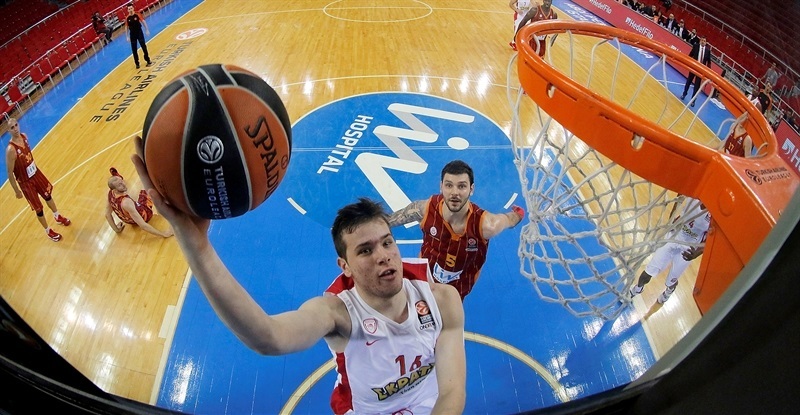 Matt Lojeski led Olympiacos with 22 points. Vassilis Spanoulis added 11 while Othello Hunter had 10 for the Reds. Arroyo had 9 points in an 11-0 opening run, but Spanoulis and Lojeski brought Olympiacos within 20-18 after 10 minutes. 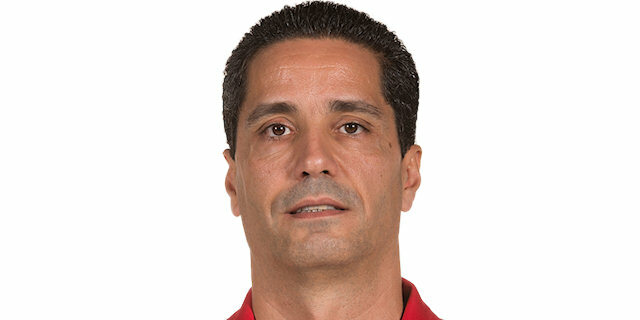 Kostas Sloukas allowed the Reds to get their first lead, 27-29, and a floater by Oliver Lafeyette gave Olympiacos a 36-38 lead at halftime. 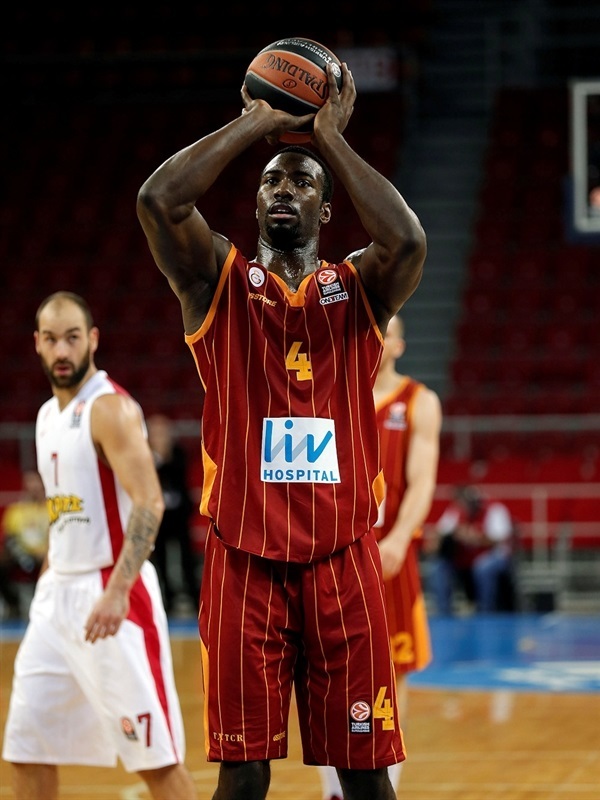 Galatasaray improved its defense after the break and kept full control on offense. A big triple by Arslan gave the hosts a 57-50 edge through three quarters. Back-to-back three-pointers by Pocius boosted Galatasaray's lead to 63-52. Olympiacos managed to get within 67-66, but Arroyo took over in crunch time to allow Galatasaray to keep fighting for Euroleague glory. Arroyo got Galatasaray going with back-to-back mid-range jumpers off the dribble. Olympiacos committed 3 turnovers on as many offenses and a six-meter jumper by Arroyo caused the Reds to call timeout at 6-0. Young shined with a tip-in, which a red-hot Arroyo bettered with a triple for an 11-0 Galatasaray start. Spanoulis answered from downtown and added an off-balance jumper to make it 11-5. After Spanoulis scored in penetration, Young split free throws and a driving layup by Sinan Guler boosted the hosts' lead to 14-7. Spanoulis made free throws and a fast break layup by Matt Lojeski brought the guests within 3. Guler shined with a huge driving basket, before Dimitris Agravanis scored down low. 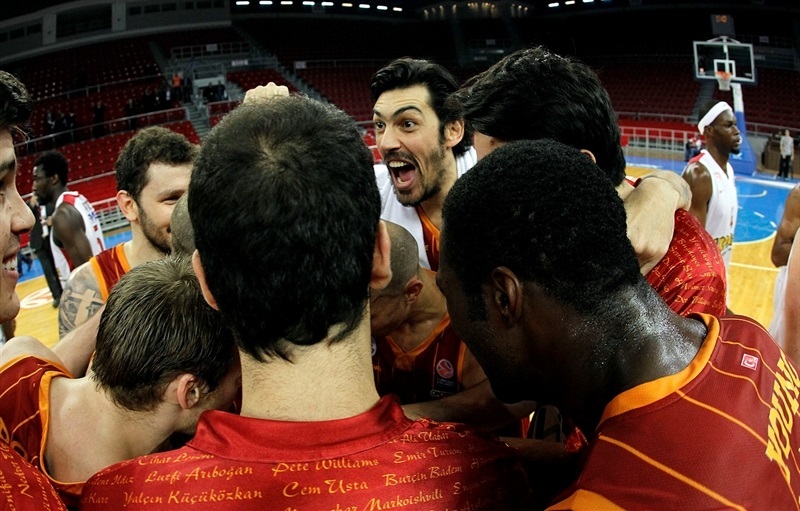 Vladimir Micov restored an 18-13 Galatasaray edge. Lojeski nailed a three-pointer. After Guler hit a floating shot, a layup by Othello Hunter got Olympiacos within 20-18 after 10 minutes. Micov took over with a big basket in the paint early in the quarter. Brent Petway quickly answered with a tip-in and a put-back basket by Kerem Gonlum made it a 4-point game. Kostas Sloukas hit his trademark stop-and-pop jumper, which Arroyo bettered with a catch-and-shoot triple, good for a 27-22 Galatasaray margin. Petway sank a jump hook, which Tremmell Darden followed with a corner three-pointer to tie the game at 27-27. A driving layup by Sloukas soon gave Olympiacos its first lead, 27-29. Petway had a huge block on Gonlum's dunk attempt. Sloukas sank free throws, but a fall-away jumper by Arroyo kept the hosts within 30-31. Sloukas insisted with more foul shots, but Arroyo bettered them with a three-pointer and Young put the hosts back ahead, 35-33. After Lojeski nailed another triple, Ender Arslan split free throws. A jumper by Oliver Lafeyette gave the Reds a 36-38 edge at the break. Micov struck from downtown right after the break to give Galatasaray the lead, 39-38. Hunter scored around the basket. 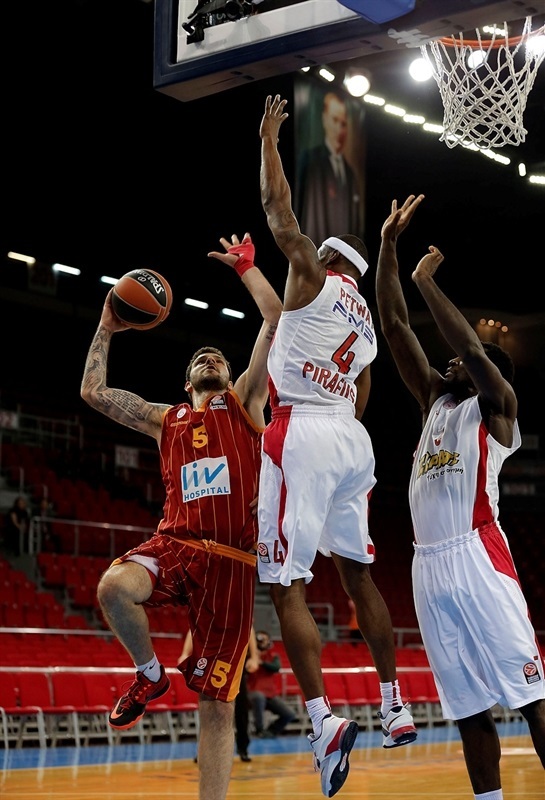 Young made free throws, but a driving layup by Spanoulis allowed Olympiacos to get a 41-42 edge. Guler scored in transition and Martynas Pocius added a three-point play to give the hosts fresh air at 46-42. Young scored down low to cause Olympiacos to call timeout at 48-42. Lojeski rescued the Reds with a three-pointer and Spanoulis fed Vasileios Kavvadas for a dunk, but another layup-plus-foul by Micov gave the hosts a 51-47 margin. Lojeski insisted with another triple, but Gonlum and Arroyo gave their team a 54-50 edge. 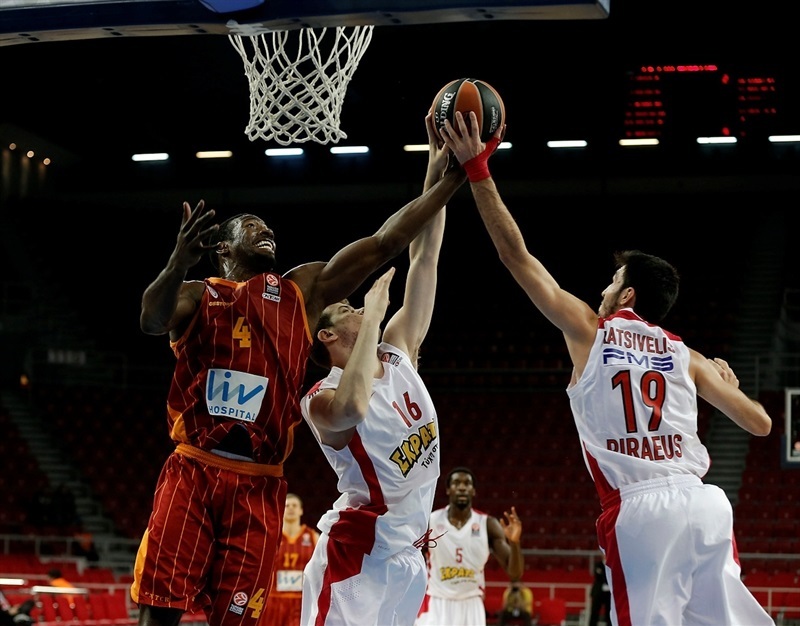 Olympiacos could not find the way to the basket for more than three minutes and Arslan fired in a big three-pointer for a 57-50 Galatasaray margin. Pocius nailed a corner three-pointer to make it a double-digit game, 60-50, early in the quarter. Hunter stepped up with a layup, but Pocius insisted from downtown for a 63-52 Galatasaray margin. 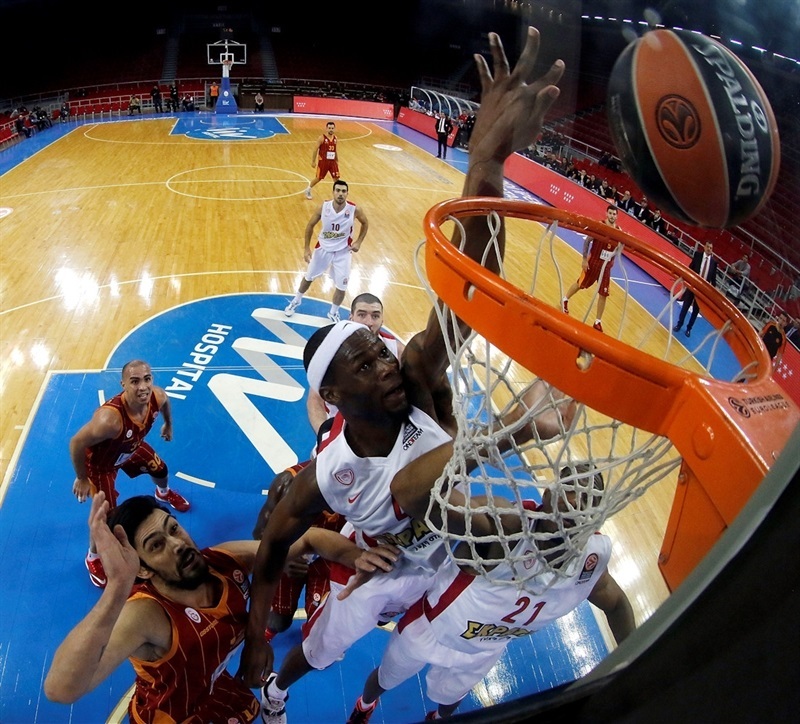 Hunter scored again and a wide-open three-pointer by Petway gave Olympiacos hope at 63-57. Young took over with a wild put-back slam in traffic, which Darden erased with a layup. Darden hit a free throw and collected a steal, which allowed Lafayette to bring the Reds even closer, 65-62. A fast break slam by Lojeski saw Galatasaray call timeout at 65-64. Young and Hunter traded dunks and free throws by Micov kept the hosts ahead, 69-66. Lojeski shined with a backdoor layup, which Guler erased with a fast break basket. A jumper by Arroyo sealed the outcome, 73-68, with 55.2 seconds left. 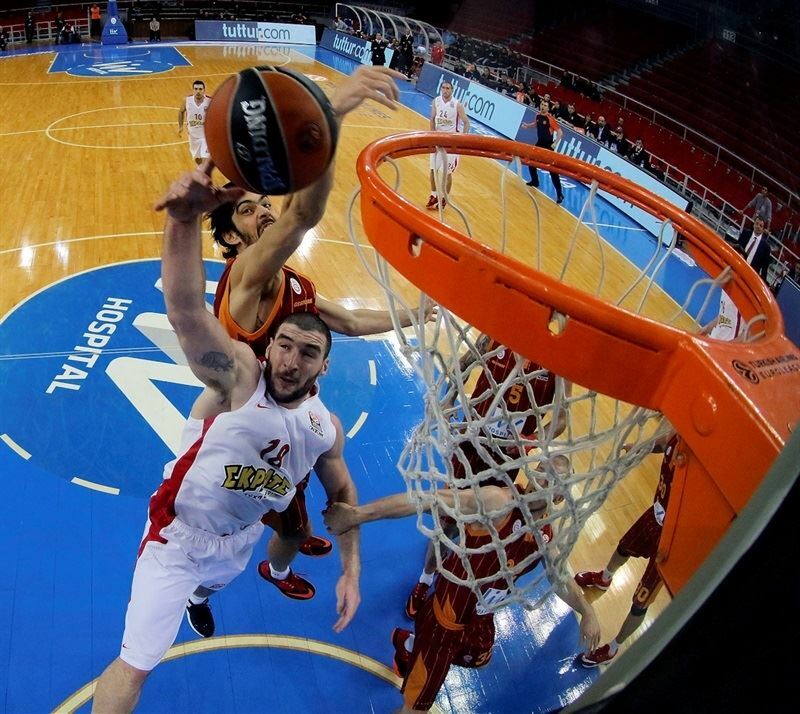 Lojeski nailed a six-meter jumper, but Arroyo hit free throws to make sure Galatasaray reached the Top 16! "I am very happy, of course. It is a historical and miracle result for us with this roster. So now, I think that our board and president will help us to build a team again for the Top 16. We will try to be as successful as last year and make it to the playoffs. Congratulations to all my players, they had a great effort tonight. This is a big club, one of the best in Europe. 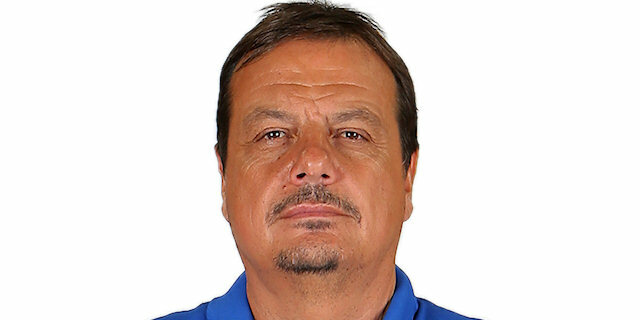 I think that our fans will help the club make an effort and we will get two more players for the Top 16. We will fight against everybody. "To win under these circumstances, we had to play different basketball with a different style. We were preparing for this since yesterday evening. We tried different defensive approaches during the game. We tried the 1-2-2 zone, and we played the 2-3 zone with the switch to man-to-man after the first pass. We stayed in front of Spanoulis with our centers. We made them confused with switching regularly. Everyone thought that Patric and Kerem would play 25 minutes together. Our opponents thought that as well. We confused them with using Micov at four. Arroyo played a great first half. In the second half, everybody played great. Everyone did contribute. I congratulate all our players." "I think credit goes first to Coach. With the little roster that we had, he just came out with a great scheme defensively and offensively. The guys bought into the system. We did a great job making them turn the ball over, stayed together, fought through adversity and came out with a win. Obviously, we are going with the mindset to win it all - and you cannot win it all without winning one game at a time, making sure you start preparing to be a champion every single day. It is going to start in practice and once we start doing things the right way, anything is possible."